Though considered an extreme sport, zip lining can be thoroughly enjoyed among the young, not-so-young and old people alike, provided that the facilities are treated with the utmost care and its consumers are excellently guided and encouraged. #1 - Mount Everest Zip Line: This fun place is found in Salvador Benedicto, Negros Occidental, and aside from their zip line, they also offer camping, swimming and trekking. Enjoy their 1 kilometer long aerial runway, that is more than 1,000 feet high, and you can fly by it like superman or wonder woman, for about 1 minute and 20 seconds. Amazing isn’t it? Do this as you cross from Barangay Igmayaan to Barangay Tuburan, take in the cool breeze of fresh air and know what feels like to be up there in the sky, as if you were a bird or a human airplane. #2 - Balungao Hilltop Adventure: Another famous zip wire in the Philippines is situated in Balungao, Pangasinan, which opened on September 8, 2011. Namely, Balungao Hilltop Adventure, an exciting destination where you can experience the second longest zip line in the Philippines, which happens to be the longest zip line in Region I, Philippines; located at the foot of Mount Balungao. You not only can do their aerial rope slide, but also their quad bike, bungee trampoline, biking, mountain climbing, and hot and cold spring swimming pools. #3 - Dahilayan Adventure Park: If you are looking for more thrill and euphoria, why don’t you include Dahilayan Adventure Park in your itinerary? Dubbed as Asia’s longest Dual Zip line, it is located in stunning countryside Cagayan de Oro, and you can swoop its 840-meter long and 4,700 feet high death slide there (well, at least, that’s another way to call a zip line, please excuse us, not meant to give a scare though lol) at a maximum speed of 90 kph. Wow! #4 - Seven Falls Zip Line: Known as the highest zip line in South East Asia, you can find Seven Falls Zip line, in Barangay Lake Seloton, at Mountain Log Resort in Lake Sebu, South Cotabato, Cotabato City. This is a first class municipality in the province and as you fly through this zone via the zip wire, you will go past 7 beautiful falls, as your view. The lake shores and surrounding rainforest are where you can find the indigenous T’bolis, Tinurays, Ubos and Manobos. Be deliriously happy as you stay on air at a height of 180 meters and travel the skyline of either 740 meters or 640 meters long. #5 - New Israel Eco Park: A perfect place for backpackers as well, New Israel Eco Park is proud of its 2.2 km Asia’s longest zip line, which is situated at Barangay New Israel, Makilala, North Cotabato. The province of Makilala is a first class municipality in Cotabato province and Barangay New Israel can be found near Mount Apo National Park. The community was established by the Moncadistas, which is a religious organization. Moreover, Barangay of New Israel is the starting point of climbing Mount Apo. Lastly, you can see here a troop of tamed monkeys, which have been living there for a whopping 5 decades already. #6 - Hoyohoy Highland Stone Chapel Adventure Park: Located in Hoyohoy, Tangub, Misamis Occidental, Hoyohoy Highland Stone Chapel Adventure Park is owned by Highland Stone Chapel Corporation Incorporated. Enjoy zip lining there from an elevation of no less than 850 meters. This remarkable park is located near Ozamiz City Airport so it is an ideal spot for tourists seeking mind-blowing amusement in the Philippines. #7 - Delta Discovery Park: Last but definitely not the least, welcome to Delta Discovery Park, in Purok 7, Barangay Bonbon, Libertad, Butuan, Mindanao, Philippines! Here is where you will also find Bancasi Domestic Airport and FYI, Butuan is the commercial center of Caraga region, with its major roads connecting it to Davao, Cagayan de Oro, Malaybalay, Surigao and soon, Tandag. 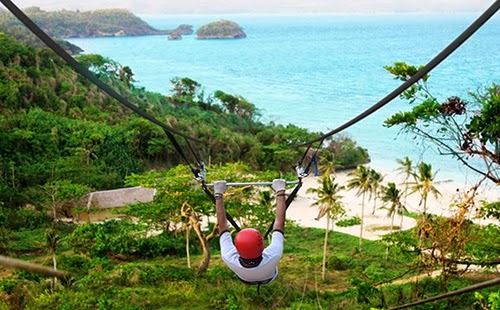 Quickly hang out with their tiptop zip line and sea Butuan from the sky for an aerial trip of 1.3 kilometers and 400 meters, as you scream at the top of your lungs there in ecstasy.